New ProPEX ® engineered polymer (EP) opposing-port tees reduce the number of required fittings in a riser application by 75%. Apple Valley, Minn., Nov. 1st, 2016 — Uponor North America (Uponor) is now offering an innovative solution for PEX hydronic heating and cooling applications with back-to-back installation spacing constraints. "Our new ProPEX EP opposing-port tees are a time-, cost- and labor-saving solution for hydronic piping systems,"says Casey Swanson, sr. manager, Commercial Segment at Uponor. 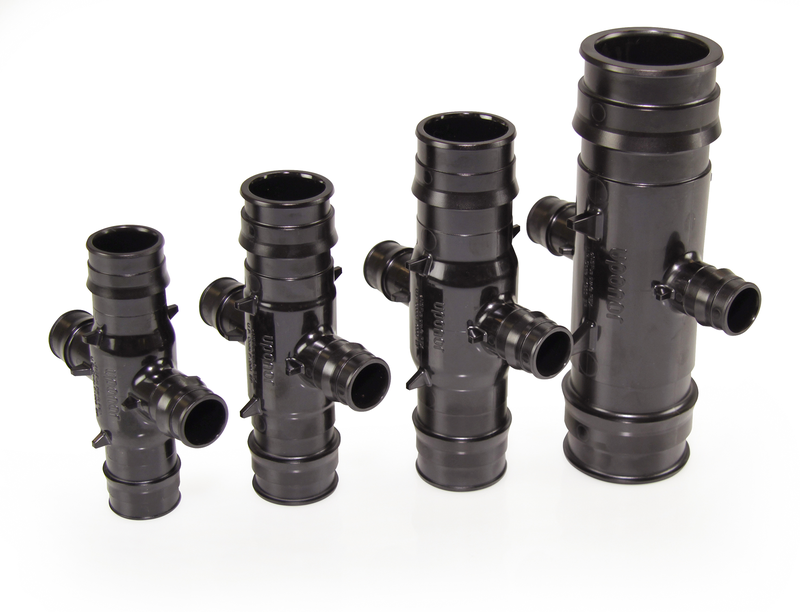 "Instead of using four fittings to change piping direction in a confined space, an opposing-port tee can do it with just one part." Available in 1", 1¼", 1½" and 2" flow-through sizes with ¾" outlets, the ProPEX EP opposing-port tees are listed to ASTM F1960 as well as NSF 14, and they are code-compliant with the International Mechanical Code (IMC) and Uniform Mechanical Code (UMC) for hydronic heating and cooling applications. Uponor’s new ProPEX® EP opposing-port tees are available in 1", 1¼", 1½" and 2" flow-through sizes with ¾" outlets.